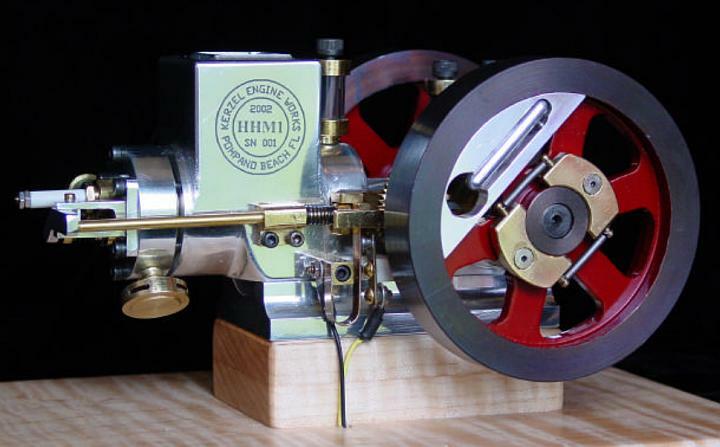 David Kerzel has free plans for this beautiful hit & miss engine he designed. It may look like it’s made from castings but it’s actually made from bar stock. The cylinder has a .75-inch bore and the flywheels are 3.5-inch in diameter. The plans also come with some well-written and very helpful construction notes. You can find the links to download David’s plans and notes near the bottom of this web page. I built a power hammer and would like to build an engine to run it. It has a 25 lb. hammer. Please send free plans to build my hit and miss engine. You have to go to David’s website to get them. Last sentence of the short paragraph above is the link to go there. I like your hit & miss engine. I would like to download your free plans. Read the post again, click on the link to the designer’s web page and download the plans from there. Create an account, and post it in the forum. Plans Received Very Many thanks. Any chance I could download the plans please? Peter, visit the link in the post and you’ll find a link to download the plans. You’ll also find building notes and other helpful information.